Well as we all know, today is the day day of the royal wedding! What dress will Kate wear? Will she say I do? Will Prince Phillip make an inappropriate comment to a foreign dignitary? 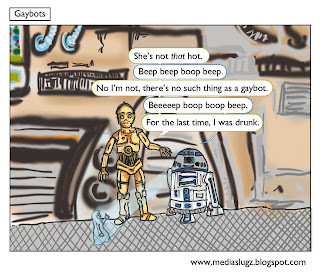 I thought I'd get into the spirit of things too by posting this Star Wars Comic. If I wasn't in work during the wedding I'd be watching Star Wars. Lovely day for a bit of Star Wars. Oh and in case you where wondering, she'll wear a white one, yes she will and of course he will.